unfortunately not to our house. This little guy belongs to my mom and his name is Sammie. And yes, he is full of PISS and VINEGAR - but how can you resist those green eyes??? 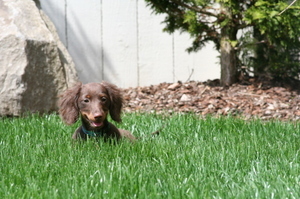 Sammie is a chocolate long hair miniature dachshund. 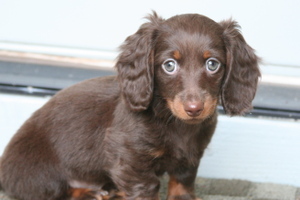 He is from a breeder here in Washington and does have some Auslagen in him. Auslagen is the line that my three come from. Love having a puppy around - but this has showed me that I really don't NEED another one. In our little home and our travel schedules it just wouldn't be fair. Hubby doesn't read my blog on a regular basis so I can put this out there. I ask him at least once a month for another one - they are like Dorito's, you just can't have one!